The Flame Nebula sits on the eastern hip of Orion the Hunter, a constellation most easily visible in the northern hemisphere during evenings in the winter. 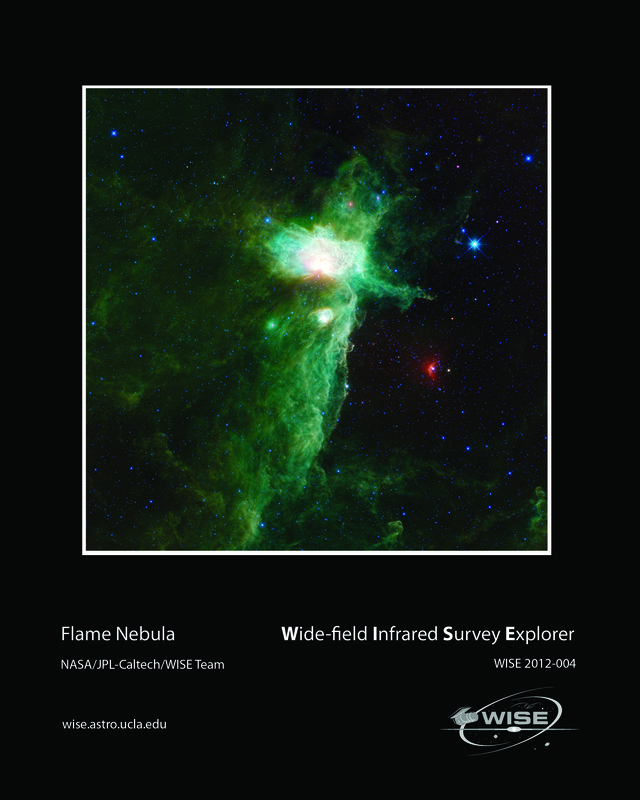 This view of the Flame nebula from WISE, NASA’s Wide-field Infrared Survey Explorer, shows an expanded view over one previously released of this enormous space cloud (http://wise.ssl.berkeley.edu/gallery_FlameNebula.html). The previous image was made from data WISE collected after the coolant began to run out, when only 3 of WISE’s infrared bands were in operation. The flame nebula is a very infrared-bright region, and the reduced sensitivity during the 3-band phase of the WISE mission worked to the advantage of astronomers interested in studying the brightest parts of this region without so much glare. This new image was made from data collected when WISE had all 4 infrared bands working. This view takes in a vast cloud of gas and dust where new stars are being born. Three familiar nebulae are visible in the central region: the Flame nebula, the Horsehead nebula, and NGC 2023. 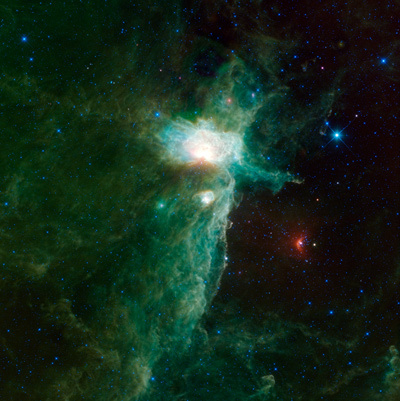 The Flame is the brightest and largest in the image. It is being lit up by a star inside it that is 20 times the mass of the Sun and would be as bright to our eyes as the other stars in Orion’s belt if it weren’t for all the surrounding dust, which makes it appear 4 billion times dimmer than it really is. NGC 2023 is the bright knot below the Flame. The famous Horsehead nebula is visible poking out of the edge of the cloud, just to the right of NGC 2023 and down a touch. It takes on a very different view in infrared compared to visible light. In visible light, the horse’s head is a silhouetted dark cloud in front of glowing gas. But here, we see the dust in that dark cloud glowing in infrared light. Two of the three stars in Orion’s belt are visible in this image, but despite their prominence to our eyes in the night sky, they are somewhat unremarkable as seen by WISE. Alnitak, the far left star in Orion’s belt, is a multiple blue giant star system located 736 light-years away. In this image, it is located just to the right of the central part of the Flame nebula. Alnilam, the middle star of Orion’s belt, is a variable blue supergiant, located 1,980 light-years away. Despite having a radius 24 times bigger than the Sun, and luminosity 275,000 times greater than the Sun, it only appears as a moderately bright star near the upper right corner of this image. Another noteworthy feature in this image is the bright red arc at the lower right. This arc surrounds the star sigma Orionis, the upper star in the sword of Orion, which hangs from his belt. It is a blue dwarf multiple star system, located 1,070 light-years away. It is moving through space at a breathtaking speed of 50 km/s (113,000 mph). At that speed, winds from the star system crash into the gas and dust outside the system and create a bow shock, where material in front of the speeding Sigma Orionis system is piling up. 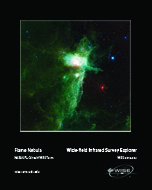 The energy from the bow shock heats up dust in the region and makes it glow in infrared. <. Color in this image represents specific infrared wavelengths. Blue represents light emitted at 3.4-micron wavelengths and cyan (blue-green) represents 4.6-microns, both of which come mainly from hot stars. Relatively cooler objects, such as the dust of the nebulae, appear green and red. Green represents 12-micron light and red represents 22-micron light.